Figure 1. Panel A: Arrow shows an atrial branch from the proximal segment of right coronary artery (RCA). Panel B: loss of atrial branch (\\) after the stent implantation. The conclusions of a research in which the B2SLab participated suggests that atrial ischemic episodes are a potential cause of atrial fibrillation (AF) in patients with coronary artery disease. Accidental atrial branch coronary artery occlusion (ABO) after elective percutaneous coronary interventions (PCI) is an excellent model to assess supraventricular arrhythmias such as atrial fibrillation, since they are related to atrial ischemia in humans. PR segment deviation, atrial tachycardia, atrial fibrillation and plasma biomarkers associated with myocardial infarction were found with higher incidence in ABO patients. Clinical data, 12-lead ECG, 12-hours Holter recordings, coronary angiography, and serial plasma levels of high sensitivity troponin T and mid-regional proatrial natriuretic peptide were prospectively analyzed in 109 patients undergoing elective angioplasty of the right or circumflex coronary arteries. 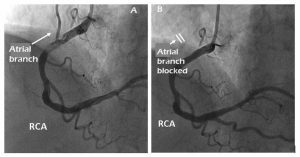 Atrial coronary branches were identified and, after the procedure, patients were allocated into two groups: atrial branch occlusion (ABO, n=17) and atrial branch patency (non-ABO, n=92). As compared with the non-ABO, patients with ABO showed a higher incidence of periprocedural myocardial infarction (20% vs. 53%, p= 0.01), more frequent intra-atrial conduction delay (19% vs. 46%, p=0.03), more marked PR segment deviation in the Holter recordings and a higher incidence of atrial tachycardia (15% vs. 41%, p=0.02) and atrial fibrillation (0% vs. 12%, p=0.03). 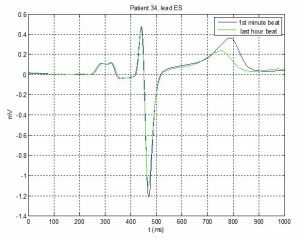 Our group has participated in ECG signal processing from Holter recording raw of patients’ data to statistical analysis. Mainly, in signal conditioning for improving S/N ratio, atrial activity detection through P-wave delineation and feature extraction: P-wave amplitude, PR segment deviation, etc. Evolving PR segment deviation in a patient of the atrial branch occlusion (ABO) group (1st minute beat vs. 12 hours beat after occlusion). Lack of PR segment deviation change in a patient of the non-ABO group is observed. Jesús Álvarez-García, Miquel Vives-Borrás, Pedro Gomis, Jordi Ordóñez-Llanos, Andreu Ferrero-Gregori, Antonio Serra-Peñaranda, Juan Cinca (2016). 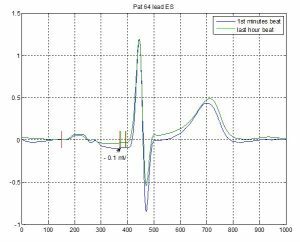 Electrophysiological Effects of Selective Atrial Coronary Artery Occlusion in Humans. Circulation, (accepted, publish ahead of print, doi: 10.1161/CIRCULATIONAHA.116.021700).